Pesticides are the only toxic substances we intentionally release into our environment in order to kill living things. The chemicals don’t just harm their intended targets though – pesticides have been linked to an increasing number of human health conditions, ranging from headaches and nausea to cancer, endocrine disruption and neurological problems. Agricultural chemicals are toxic to the environment too – they poison our water supplies, destroy our land and kill off our pollinators, the precious bees. Diatomaceous Earth (DE) is a fine powder made from the fossilized remains of tiny, aquatic organisms whose skeletons are rich in a natural substance called silica. Shaped like a cylinder, these minuscule fossils have razor sharp edges which don’t affect humans but can cut and kill parasites and small insects. DE acts a powerful insecticide which can be used against a variety of garden pests including aphids, ants, mites, earwigs, cockroaches, snails and slugs. However, it shouldn’t harm worms or any beneficial microorganisms in the soil! Sprinkle the silica-rich powder around the garden on the affected areas. You can spread it by hand or by using a dust applicator bottle. If it rains right after the dust application, it will need to be reapplied. There’s a reason garlic has been used for centuries as a natural medicine – it has antibacterial, antiviral, and anti-fungal properties. These attributes are also what make this healing herb such a potent pesticide. Making a batch of garlic pesticide is quick and cost-effective. Peel and crush the cloves from five bulbs of garlic and mix them with 17 oz of water. Allow to infuse for at least six hours. Add in a dash of natural dish soap before passing the mixture through a fine strainer. Dilute this liquid with a gallon of water and decant into a spray bottle. Spray this mix on your plants once or twice a week – mixing up a fresh batch weekly – for best results. If you’re using this garlic pesticide on your vegetable garden, avoid using it close to harvest time as it may affect the food flavors. You should also be aware that garlic is a broad-spectrum pesticide which will kill all insects it comes into contact with. To avoid destroying beneficial bugs, only spray the plant parts that are infested. A vegetable oil pressed from the fruits and seeds of the neem tree, neem oil is a natural pesticide, insect repellent and medicinal herb that has a bitter taste and garlic odor. It’s practically non-toxic to birds, mammals, bees and plants. This broad spectrum bug killer can be used on virtually any sort of garden creepy-crawlie – it’s known to be effective against over 200 species of chewing or sucking insects! It also fights fungi, mildews and rusts. Neem oil spray is most useful when applied to young plants where it can act for up to 22 days. However, rain will wash the oil away, rendering it ineffective. To make a batch, mix a teaspoon of pure, cold pressed neem oil with a half teaspoon of soap and a quart of warm water. Apply this mix to all parts of the plant. If you feel you need a stronger solution, you can add in another teaspoon of neem oil to the blend. Epsom salt has many great uses in the garden – one of which is as a pest deterrent and pesticide. Spraying and sprinkling are two of the most effective ways of using these magnesium rich salts to combat bugs. To make an Epsom salt spray, dissolve one cup of the salts (available from here) in five gallons of water. Decant into a spray bottle and apply to the affected plants. This will work to burn slugs and beetles, ensuring they keep their distance. An easier option is to simply sprinkle the salts around the base of your plants, reapplying every other week. This will not only deter pests, but will also increase nutrition absorption, as magnesium helps plant roots take up vital nutrients like nitrogen, phosphorus and sulfur. This is a simple but effective spray, made using just two ingredients – soap and oil. It works by coating soft body insects, like aphids and mites, in oil. The added soap helps the oil stick to the bugs. To make, just mix a cup of vegetable oil with a quarter cup of liquid soap. Shake this well until it turns white in color – hence its name! This is a concentrate which needs to be diluted before using. When you want to treat your plants, mix one tablespoon of this liquid with four cups of water. Re-apply every five to seven days. White oil concentrate will keep for approximately three months in a sealed container or jar. This fresh-scented lemon pesticide is especially useful if your garden is inundated with aphids – those sap-sucking insects that do untold damage to your precious plants. To make, simply bring a pint of water to the boil. Meanwhile, grate the rind from one lemon. Once the water is boiling, remove it from the heat and add the lemon rind. Allow to steep overnight before straining the liquid through a cheesecloth or fine mesh sieve. Pour this clear liquid into a spray bottle and apply to the top and underside of the leaves of the affected plant. Note that the mixture must come into contact with the insects’ bodies to be effective. If you’ve ever touched your nose or eyes after cutting hot peppers, you’ll understand exactly why this pesticide is so effective! While you can purchase natural hot pepper sprays at the store, they can be expensive – especially considering they usually require frequent applications. Firstly, you’ll need to wear gloves! Then you can add two cups of chopped hot peppers (like habaneros) to a food processor with a tablespoon of cayenne pepper and a bulb of garlic (cloves extracted and peeled). Puree this fiery mixture and place in a bucket with four gallons of water. Allow to steep for 24 hours before straining. Mix in three tablespoons of dish soap to the spicy liquid and pour into a spray bottle. For a pest free garden, apply liberally to your plants twice a week. Essential oils can be put to great use in the garden. They work to do everything from attracting pollinators to suppressing fungus. Rosemary essential oil helps repel flies, fleas, mosquitoes and insect larvae like the cabbage looper caterpillar. Peppermint essential oil eliminates aphids, squash bugs, ants, spiders, beetles, and fleas. Thyme essential oil works against biting insects like chiggers, ticks and roaches. Clove essential oil helps deter many flying insects. Cedarwood and pine essential oils keep slugs and snails at bay. Or, for an all-purpose insecticide, mix a teaspoon of vodka with 10 drops of lemon essential oil, 10 drops of eucalyptus oil, 10 drops of cedarwood oil and an ounce of water. Add to a glass spray bottle and apply thoroughly, shaking before each use. 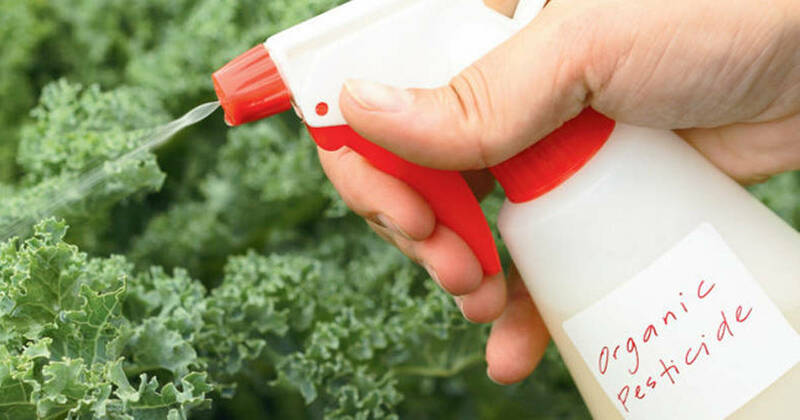 Horticultural soap sprays like this one are a simple way to eliminate small soft-bodied insects like aphids, mealybugs and spider mites. This organic pesticide recipe couldn’t be simpler to make – all you need is a natural soap like Dr. Bronner’s Pure Castile Soap which is free of synthetic additives and fragrances. Stir in a tablespoon of the soap to a quart of warm water and spray onto your plants. To boost its pesticide power, consider adding a few drops of one of the essential oils listed above, or a teaspoon of garlic or cayenne powder. Rubbing alcohol is yet another substance that can help you eliminate garden pests naturally. For soft-bodied insects, straight 70% or 90% isopropyl rubbing alcohol should be used. If you just need to tackle a small infestation, apply the alcohol directly to the insects with a cotton swab soaked in the alcohol. Larger infestations mean the alcohol should be sprayed directly on the entire plant – including the stems, flowers and underside of the lower leaves. As alcohol evaporates quickly once exposed to air or sun, it should cause minimal damage to the plant. Repeat the application once or twice a week until the pests are no longer an issue. Note: When using any homemade mixture on your plants, always carry out a patch test on a small area first before commencing full treatment. Observe this patch for a day or two to ensure the solution has caused no harm.